Which Homeric Hero Would You Be? In the recent poll prompted by Dio Chrysostom’s anecdote of Philip asking which hero Alexander would be, Odysseus won by a bit of a landslide. I can’t say this completely surprises me, but it does trouble me just a little bit. What is it that attracts us to Odysseus? My post and translation also drew some ire because I translated polytropos as “shifty”. It seems that we as a collective are entirely sure about what we think this word means. And, as a result, we are confident in who we think Odysseus is. This post turns out to be longer than might be ideal, but I am just going to leave it as is. My basic belief, which I get to eventually, is that Odysseus is popular because of his essential polysemy. We think we love Odysseus because we choose an Odysseus we want to love. The important takeaway from this is that such ‘shiftiness” (when it comes to character and reception) is an essential part of his character. First, a basic assertion: Homer’s version of Odysseus is not the only one. Even as early as the fifth century there were some, well, complaints. Second, jumping over 2500 years, there is a cognitive link between what we name something and how we expect that element to emerge in stories. So, how we name Odysseus and what we think this name means matters (see also Peradotto 1990 among others on this). Big O for the win. Mark Turner. The Literary Mind: The Origins of Thought and Language. Oxford: 1996. So, there is significance both in how we name Odysseus and how we modify that name. Let’s take up his epithets first. I received a good deal of complaining about my translation of Odysseus’ famous epithet as “shifty”. He actually only gets called polytropos rarely in the Odyssey. But he does receive a surplus of epithets that point to a manifold nature. he WAS the most "modern" in his sensibilities. btw, i voted for Hektor. he's my moral hero. Here are some other epithets. 1.205 φράσσεται ὥς κε νέηται, ἐπεὶ πολυμήχανός ἐστιν. Odysseus is only sometimes called “many-wayed”. He is also marked out for his suffering. Odysseus’ is not just about his own suffering–as Erwin Cook shows, part of the point of being a ‘hero’ in ancient Greek myth and poetry is that you have a capacity to suffer and to mete out suffering. But what might polytropos even mean? Many on twitter think they know, but the ancients were not unanimous. πολύτροπος γὰρ ὁ ἀνὴρ καὶ πρὸς τὴν τῶν πραγμά-των φύσιν συμμεταβάλλεται. ᾿Απορία. πολύτροπον] οὐκ ἐπαινεῖν φησιν ᾿Αντισθένης ῞Ομηρον τὸν ᾿Οδυσσέα μᾶλλον ἢ ψέγειν, λέγοντα αὐτὸν πολύτροπον. οὐκ οὖν τὸν ᾿Αχιλλέα καὶ τὸν Αἴαντα πολυτρόπους πεποιηκέναι, ἀλλ’ ἁπλοῦς καὶ γεννάδας· οὐδὲ τὸν Νέστορα τὸν σοφὸν οὐ μὰ Δία δόλιον καὶ παλίμβολον τὸ ἦθος, ἀλλ’ ἁπλῶς τε ᾿Αγαμέμνονι συνόντα καὶ τοῖς ἄλλοις ἅπασι, καὶ εἰς τὸ στρατόπεδον εἴ τι ἀγαθὸν εἶχε συμβουλεύοντα καὶ οὐκ ἀποκρυπτόμενον τοσοῦτον ἀπεῖχε τοιοῦτον τρόπον ἀποδέχεσθαι ὁ ᾿Αχιλλεὺς ὡς ἐχθρὸν ἡγεῖσθαι ὁμοίως τῷ θανάτῳ ἐκεῖνον “ὅς χ’ ἕτερον μὲν κεύθει ἐνὶ φρεσὶν, ἄλλο δὲ εἴπῃ” (Il. ι, 313.). λύων οὖν ὁ ᾿Αντισθένης φησὶ, Τί οὖν; ἆρά γε πονηρὸς ὁ ᾿Οδυσσεὺς ὅτι πολύτροπος ἐκλήθη; καὶ μὴν διότι σοφὸς οὕτως αὐτὸν προσείρηκε. μήποτε οὖν ὁ τρόπος τὸ μέν τι σημαίνει τὸ ἦθος, τὸ δέ τι σημαίνει τὴν τοῦ λόγου χρῆσιν; εὔτροπος γὰρ ἀνὴρ ὁ τὸ ἦθος ἔχων εἰς τὸ εὖ τετραμμένον· τρόποι δὲ λόγων αἱ ποιαὶ πλάσεις. Soc. “People who are many-wayed are deceptive because of their foolishness and thoughtlessness, or because of wickedness and some thought? Hippias: Most of all, because of wickedness and intelligence. Soc. So, it seems, they are really intelligent. Hip. Yes, by Zeus, wicked smart. Soc. And men who are smart—are they ignorant of what they do or do they understand it? Hip. They really understand what they are doing. For this reason, they also do evil. Soc. So, is it the ignorant or the wise who know these things which they understand? Hip. The wise know these very things, how to deceive. —ΙΠ. ῾Υπὸ πανουργίας πάντων μάλιστα καὶ φρονήσεως. —ΣΩ. Φρόνιμοι μὲν ἄρα εἰσίν, ὡς ἔοικεν. —ΙΠ. Ναὶ μὰ Δία, λίαν γε. —ΙΠ. Καὶ μάλα σφόδρα ἐπίστανται· διὰ ταῦτα καὶ κακουργοῦσιν. —ΙΠ. Σοφοὶ μὲν οὖν αὐτά γε ταῦτα, ἐξαπατᾶν. Λαῶι μὴ πίστευε, πολύτροπός ἐστιν ὅμιλος· λαὸς <γὰρ> καὶ ὕδωρ καὶ πῦρ ἀκατάσχετα πάντα. I’m going with Odysseus, despite—or maybe even because of—his (very real) complexity. He is the pro/antagonist ‘we’ love to hate for seeing ourselves in him. Or, maybe it’s just because I’m reading a lot of Rhetoric theory that uses him and his wily nature in examples. “If wise men are clever at speaking to others, then they also know how to speak the same thought in different ways; and, because they know the many different ways of words about the same matter. And if wise men are also good, then this is reason Homer says that Odysseus who is wise is many-wayed: he knew how to engage with people in many ways. Thus Pythagoras is said to have known the right way to address speeches to children, to make those addresses appropriate for women to women, those fit for leaders to leaders, and those appropriate for youths to youths. It is a mark of wisdom to find the manner best for each group of people; and it is a mark of ignorance to use a single type of address toward people who are unaccustomed to it. It is the same for medicine in the successful use of its art, which fits the many-wayed nature of therapy through the varied application to those who need assistance. This manner of character is unstable, much-changing. Many-wayedness of speech is also a finely crafted use of language for different audiences and it becomes single-wayed. For, one approach is appropriate to each. Therefore, fitting the varied power of speech to each, shaping what is proper to each for the single iteration, makes the many-wayed in turns single in form and actually ill-fit to different types of audiences, rejected by many because it is offensive to them. 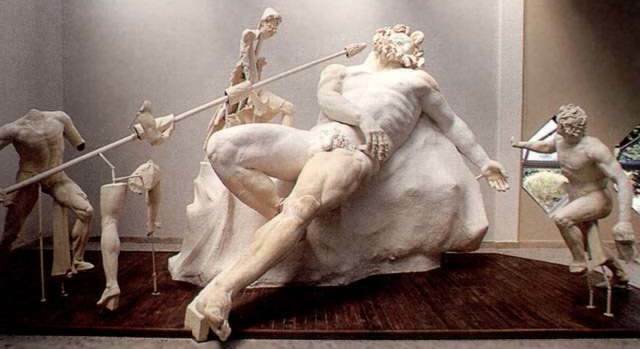 Odysseus’ name itself has problems of interpretation–it is willfully interpreted in different ways by ancient audiences and is an object of play in the epic itself. Keep reading if you want even more of this. ᾿Οδυσσεύς: Εἴρηται ἀπὸ ἱστορίας. ᾿Αντίκλειαν γάρ φασι τὴν ᾿Οδυσσέως μητέρα ἐγκύμονα ὁδεύουσαν τὸ Νήριτον τῆς ᾿Ιθάκης ὄρος, ὕσαντος πολὺ τοῦ Διὸς, ὑπὸ ἀγωνίας τε καὶ φόβου καταπεσοῦσαν ἀποτεκεῖν τὸν ᾿Οδυσσέα. Οὕτω ταύτης τῆς ὀνομασίας ἔτυχεν, ἐπειδὴ κατὰ τὴν ὁδὸν ὗσεν ὁ Ζεύς. It is more typical to derive Odysseus’ name from the verb odussomai, which means something like “being hateful, being hated”. Autolykos, Odysseus’ maternal grandfather, is reported to have named him in the Odyssey (19.407–409). Both men and women over the man-nourishing earth. Modern scholars get in on the game too: Marót in Acta Antiqua 8 (1960) 1-6 suggests that the name is developed from the scar (οὐλή=oulê) by which Odysseus is recognized, thus explaining in part the Latin (and Etruscan) variant Ulysses. For a succinct discussion, see Norman Austin 2009, 92-93 from his essay “Name Magic in the Odyssey” in L.Doherty’s Oxford Readings in Classical Studies: Homer’s Odyssey (originally printed in California Studies in Classical Antiquity 5 (1972) 1-19, available through JSTOR). See also W. B. Stanford’s “The Homeric Etymology of the Name Odysseus.” Classical Philology 47 (1952) 209-213. Eustathius records: ὁ ᾿Οδυσσεύς δέ που ᾿Ολυσσεύς καὶ ἡ ᾿Οδύσσεια ᾿Ολύσσεια. In a Boiotian inscription his name is Ὀλυσ(σ)εύς (Olusseus) and a few Corinthian inscriptions have Ὀλισ(σ)εύς (Olisseus). Rudolf Wachter (Non-Attic Greek Vase Inscriptions 2001, 267) argues that the Attic Olutteus and the Corinthian form just cited likely display a form that predates the epic spelling (and that it was the epic tradition itself that influenced the regularization). While it seems these names may be non-Greek, this does not mean that Greek audiences did not hear echoes of the roots they knew for “woolly” (oulos), “scar” (oulê) or “destructive, ruinous” (oulos) in his name. At the same time, it does not matter whether or not one form predated the other–what matters is that Panhellenic audiences may have been familiar with multiple forms. When Odysseus meets Penelope in disguise, he first describes what ‘Odysseus’ was wearing when he went to war, and then when she weeps, he comforts her by telling her that he has heard that Odysseus is nearby. Throughout his speech there are echoes of both his epic name Odysseus and what Wachter calls his “epichoric” (i.e. ‘local’) name. At all any longer, mourning your husband. I would not find fault at all. Different from Odysseus, a man they claim is like the gods. For I will speak truly and I will hide nothing. Zeus and Helios. For his companions Helios’ cattle. They all perished on the much-sounding sea. ἢ ᾿Οδυσῆ’, ὅν φασι θεοῖσ’ ἐναλίγκιον εἶναι. Ζεύς τε καὶ ᾿Ηέλιος· τοῦ γὰρ βόας ἔκταν ἑταῖροι. But hate and destruction may not be the only themes running beneath the surface of his name. The variation which becomes Ulysses might also have to do with scars or his woolly hair. And recognize his scar [oulén] and bring everything out in the open. 19.507 θερσόμενος, οὐλὴν δὲ κατὰ ῥακέεσσι κάλυψε. 21.221 ὣς εἰπὼν ῥάκεα μεγάλης ἀποέργαθεν οὐλῆς. The one exception to this separation in the Odyssey seems to be when Odysseus is transformed into a better looking version of himself in books 6 and 23. Here, the “woolly hair” begins the line, placing the same sounds in the same position as his defining scar. 6.230-231 …οὔλας ἧκε κὄμας, ὑακινθίνῳ ἄνθει ὁμοίας. (=23.158). In this, Dolios’ hapax legomenon greeting to Odysseus seems potentially playful and interesting: οὖλέ τε καὶ μέγα χαῖρε, θεοὶ δέ τοι ὄλβια δοῖεν. Here the imperative could sound like a vocative for “wool”. But, it might also recall another word that sounds the same, οὖλος “destructive”, which appears in the Iliad but not in the Odyssey. “Oule: “be healthy, from “wholeness”. This is only said once. οὖλε] ὑγίαινε· παρὰ τὸ ὅλην. τῶν ἅπαξ εἰρημένων. H.
“The Milesians and Delians call Apollo Oulios, as if he his a bringer of health and healing. For, to oulein is to “to be healthy” [hugiainein], from which we get the word “scar” [oulê] and the [greeting] “be well and be very happy”. The aural similarity between these four terms (“scar”, “wool”, “ruinous”, “whole”) and their potentially intentional juxtapositions and interplay in the Odyssey help to map out different variations on Odysseus’ character and his development in this particular epic. In folk etymology, the name (whence Roman Ulysses through Doric Olisseus?. cf. Oulikseus) may mark him as the “scarred man”, evoking the tale of his naming and thus an essential aspect of his character. The “wool” may recall both his physical trait of curly hair (emphasized in his rejuvenations in the Odyssey) and his legendary tale of sneaking out under a ram after the blinding of Polyphemos (depicted in many vase images at an early period and perhaps echoed when Priam describes him as a “ram among the sheep” in the Iliad 3.197–198). But the “wool garment” has intra-textual relevance within our epic (since Odysseus in disguise keeps asking for a cloak) and as the garment that confirms his past identity to Penelope. Both “scar” and “wool”, then, are intimately connected with the characterization of an Odysseus from a broader mythical perspective and are introduced as positive identification for the hero in this epic. The echo of a “destructive” hero is mostly up to speculation. The meaning of the final imperative “be whole”, however, might be intentionally jarring and telling: at this moment, Odysseus has finally confirmed his identities with everyone and has become whole, combining and transcending his identities as “woolly haired” and “scarred”. Οὐλὴ, τὸ ὑγιασθὲν τραῦμα καὶ φαινόμενον· ἄλλοι δὲ ἐπιπόναιον ἕλκος. Οὐλὴ καὶ ὠτειλὴ διαφέρει· οὐλὴ μὲν γάρ ἐστιν, ἡ ἐκ παλαιοῦ τραύματος ὑγιασμένη πλήγη· ὠτειλὴ δὲ τὸ πρόσφατον τραῦμα· καὶ ῞Ομηρος δὲ τετήρηκε τὴν διαφορὰν εἴπων· οὐλὴν δ’ αὐτὴν ἔρεεν αἷμα κελαινεφὲς ἐξ ὠτειλῆς. Chantraine s.v. οὐλή, “cicatrice, blessure, cicatrisée. From *ϝολ-. Cf. lat volnus, eris? Chaintraine, s.v. οὖλος 2 “Le sense ancient de οὖλος “bouclé, crépu” [“curled, frizzy”] se tire aisément de 2 εἰλέω “tourner, rouler”…Le sens secondaire de “dense” etc. n’impose pas un rapport avec 1 εἰλέω “serrer, presser”. Beeks s.v. οὖλος, “frizzy, shaggy, woolly, crinkly’ “can be connected with εἰλέω 2 “to roll, rutnr, wind’…” We may reconstruct *uol(H)-no ‘wool’, either from *uel“to twist’ or *uelH- ‘to pluck’ (Lat. Vello). οὖλος, Chantraine s.v. οὖλος 1 “tout entier”, voir ὅλος. οὐλὴν] ᾿Αττικοὶ τὸ θεραπευθὲν τραῦμα ὠτειλήν φασι· παρὰ δὲ ῾Ομήρῳ ὠτειλὴ μὲν τὸ ἀθεράπευτον, οὐλὴ δὲ τὸ θεραπευθέν. B. For anyone who has actually made it through this evidence to the end and is expecting some sort of summary, well, I don’t know if I have one. What I think it comes down to is that Odysseus is attractive because he survives and, at one level, even if we have some desire to be noble and die a beautiful death, we also want to live and believe that our story continues ever on. Odysseus provides this. In addition, Odysseus has power that is not contingent upon his body. We all know whether or not we are blessed with great speed and strength and beauty; but we also know that these things can never last. The Odyssey gives us hope that we may be distinguished and capable of excellence thanks to something we cannot see and which we believe (erroneously) does not fade or fail with time. But, most importantly, Odysseus appeals because he shifts–he is many things to many people and we choose to believe in and identify with the Odysseus we need. Even though this ‘hero’ does terrible things to most of the people he encounters, we ‘rewrite’ his story to accord with versions of ourselves and our world which are more palatable. But we should not forget that Odysseus is in part responsible for the deaths of all of his sailors, 108 of the suitors, Palamedes, perhaps Hecuba, the city of Troy, the mutilation of Melanthios and the hanging of the slave women. We could even argue that Odysseus represents the savage violence just under the surface of ‘civilization’ and that his narrative provides a justification for its very ‘necessity’. This, I think, is not a reading many of us would enjoy. By ‘loving’ Odysseus–or at least by refusing to see that his complexity embraces hard truths about human society to this day–we become complicit in his ‘crimes’. And this is all the greater testament to the power of the Homeric Odyssey–it challenges us, misleads us, delights us, and wins us over to the side of a scoundrel. By the end of this process, if we are honest, we must admit that we side with Odysseus because he reflects not just what we fear but because he channels something true about the people we fear we are. Benjamin Haller. “Dolios in Odyssey 4 and 24: Penelope’s Plotting and Alternative Versions of Odysseus’ nostos.” TAPA 143 (2013) 263-292. Man, what a great post. On top of the literal spatial/positional meaning (which of course fits Odysseus), I think of the related, semi-figurative sense of a “move” in a game (e.g. chess), since it keeps the spatial/positional meaning but adds layers of deliberation, strategy, quick tactical thinking, etc. And then there’s the closely-related athletic sense of “moves”–think of the evasive jukes and dodges of a running back, or a crossover dribble in basketball, or showing skill/style on the dance floor. And then the even more general/abstract sense of “making moves” for any goal-directed, prudent actions, especially ones that show some cunning or cleverness. Maybe there are good reasons to avoid that expression in O’s case–but I was sort of surprised not to see it among the options above. The notion of a man of many “ways” or “turns” or “devices” is obviously and intentionally vague/multiform, but “moves” fits well and sounds natural, I think. O’s arsenal included devices, shifts, dodges, twists, turns [of mind, of phrase], and lots more; in other words, he was a guy who could really make some moves. Thanks again for a wonderful read! Thanks for this! I wish there were a handy English compound that used “moves” because I think you are right about the range of semantic meaning. Greek “tropos” and its reflexes are really similar. I could never understand how Odysseus became Uli-sses. Even I felt (as a greek) insulted by the re naming.Now I know and thank you for this. Your work is an excellent offer for people interested in the field.